Halt to trot transitions are asked for at the beginning of most dressage tests. 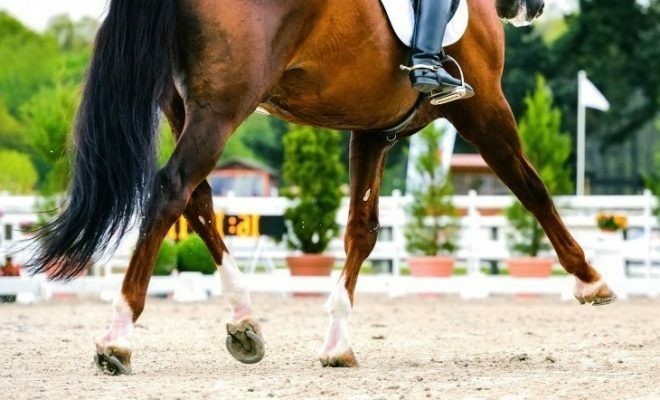 Halt to trot transitions are useful as a schooling exercise to make your horse sharp to your leg aids and to encourage him to step underneath himself more during the transition, thus engaging his hind legs. Here’s some more information about how to ride good halt to trot transitions. In a dressage test, the judge is looking for a positive entry into a good halt prior to the trot transition. The halt itself must be straight and square with the horse’s weight evenly distributed over all four legs. The horse should be attentive, waiting for the next signal from his rider, whilst maintaining immobility for at least three seconds before moving off. He should remain quiet in the contact, with his poll at the highest point, and his nose slightly in front of the vertical. 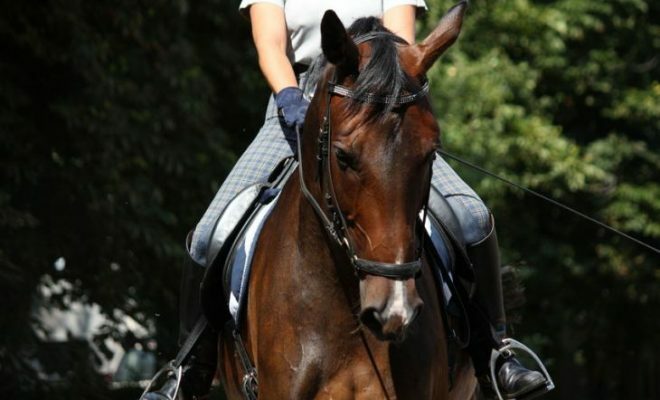 The move-off should be immediate and direct, without any walk or jogging steps before the horse picks up trot. If the horse is allowed to ‘wander’ into trot, he’ll probably not stay straight and will lose engagement, falling onto his forehand. When you introduce direct halt to trot transitions, it can be helpful to position your horse along the fenceline, rather than on the centre line. This will make it easier for you to keep him straight in the halt and in the move-off. To encourage a direct move-off, make sure you’re facing an open space, rather than the wall or fence. Start with a good halt as described above. The strength of the leg aid you use will depend on your individual horse; a sharp horse may need less leg than a lazy one. Apply both legs on the girth in a firm squeeze to ask the horse to move directly into trot. You might need to back this up with a sharp kick or a tap with your schooling whip, if you don’t get a reaction. Try not to startle your horse into trot from a sleepy halt. If your downward transition was good, your horse should remain attentive and be waiting for your next aid. 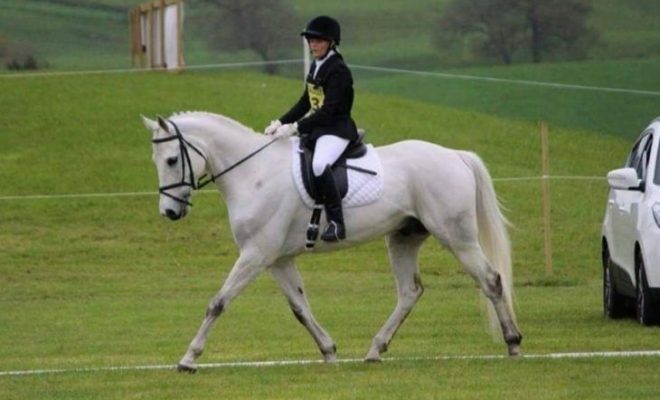 As you ask for the upwards transition into trot, ease your hand slightly to allow the horse to move forwards. Don’t worry too much if he loses his frame during the transition. Once he’s in trot, reorganize him into an elastic contact and correct outline; the most important thing when he’s learning is his desire to move directly forward off your leg into trot. It’s very important that the horse is not allowed to jog or walk into trot. If you allow him to make the transition indirectly, you are effectively training him to get it wrong! When your horse is confident and obedient in the direct transition to trot, introduce the movement on the centre line. The most important consideration here is the straightness of both the halt and the move-off. If your horse is inclined to wobble into halt or during the move-off, try placing two jump poles parallel to each other, about three feet apart, straddling the centre line. This will give you both a visual guide and will encourage your horse to remain straight. Riding good transitions from halt to trot is a great way of sharpening your horse’s reaction to your leg aids and developing engagement. 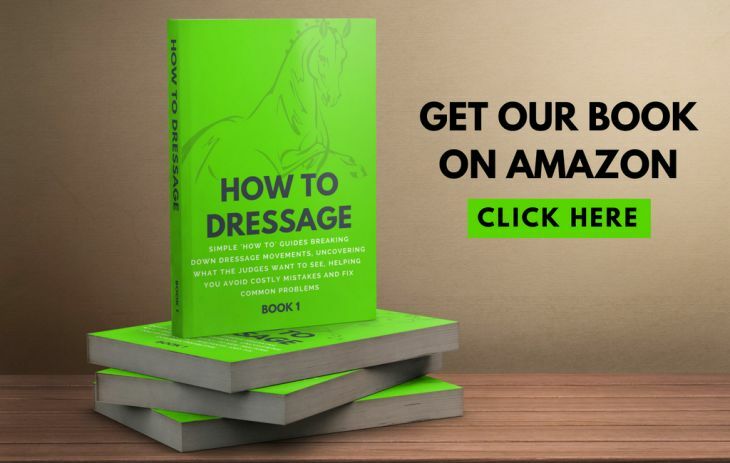 If you can ride a good halt, followed by a crisp, straight obedient transition into trot, you should get a good mark in your dressage tests too.